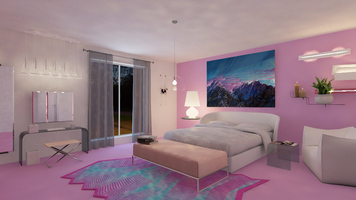 Interior design sample by Brian S.
Interior designer and stylist holding a Masters of Architecture degree. Deeply inspired by fashion, art and the avant garde. Brian strives to bring a touch of the unexpected to every design along with an elevated sense of eclectic glamour. His designs are not only visually appealing but also functionally rooted. He obtained a myriad of technical skills during his time at university allowing him to execute everything from conceptual renderings to accurately drawn construction documents. Brian also holds a BA in Media Advertising. My personal go to style is eclectic, I enjoy taking various pieces and styles and merging them in a way that evokes a unique sense of elegance. My designs are heavily influenced by retro designs from the 70's, 80's, and 90's. I strive to revisit these styles and re-interpreting them in a way that new and interesting. I do not know if it is necessarily a secret, but I definitely use juxtaposition in most of my designs, primarily with textures. I love putting a rough looking piece next to a soft pillow to really elevate the tactile attributes of both. I am definitely inspired by fashion, art, and "retro interiors". I am a huge proponent and advocate for the interconnectedness between the arts, fashion, and the built environment. I can take inspiration from almost anything but I am deeply committed to producing designs that my clients will love.